Mr. Bernhard Maier, CEO of Škoda Auto visited our laboratory. We have shown him running projects solved in cooperation with or for the Škoda Auto. HE Daniel Meron, Ambassador of Israel in Czech Republic visited our laboratory. Prof. Simon Godsill, head of Information Engineering Division in Cambridge, visited our laboratory. Colleges from SCCH visited our laboratory. Dr. Patrick Pérez, Scientific Director of valeo.ai, a Valeo AI research lab focused on self-driving cars, visited our laboratory. The fourth general assembly of SafeLog project is hosted at CVUT CIIRC. Prof. Ruzena Bajczy shortly visits our laboratory just few days before she was honored by doctorate honoris causa at CVUT. Nobel Prize winner prof. Stefan W. Hell shortly visits our laboratory. 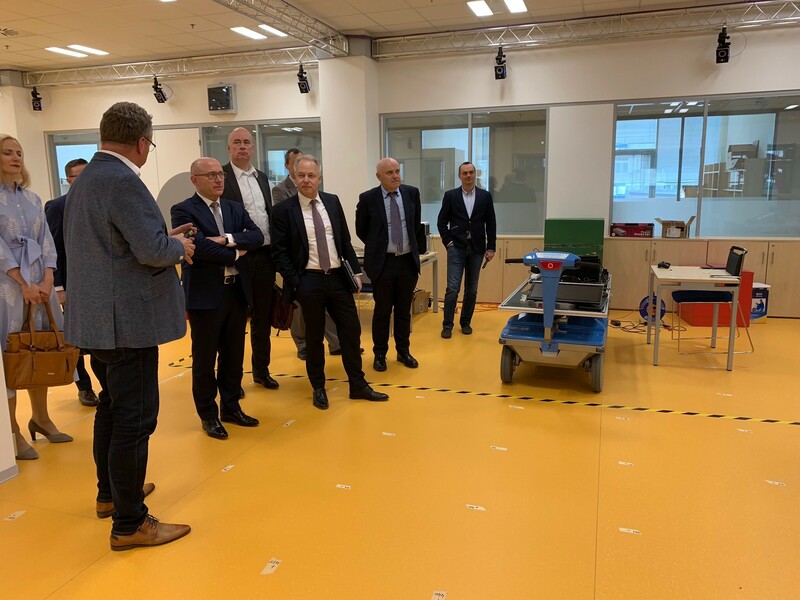 Martin Ford, the author of the well-known book Rise of the Robots: Technology and the Threat of a Jobless Future , shortly visited our laboratory. Marco Dorigo gives an interesting talk about Swarm Robotics Research at the IRIDIA AI lab at 14:00 in room A102 of CVUT CIIRC building. We host the RoboCom++ plenary meeting. 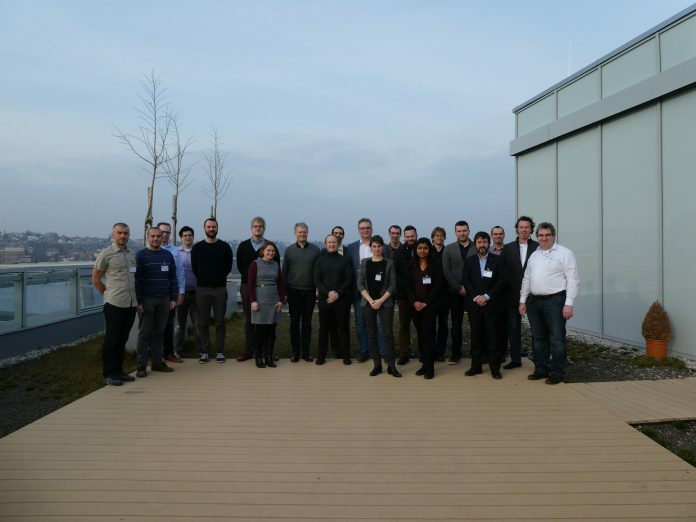 The SafeLog project gets the excellent progress mark at first progress-review meeting in Luxembourg. Japan’s Minister of Economy, Technology and Industry, Mr. Hiroshige Seko visited our laboratory. Libor Preucil gives a talk at conference Průmysl 4.0. First periodic meeting of the kassandra project. 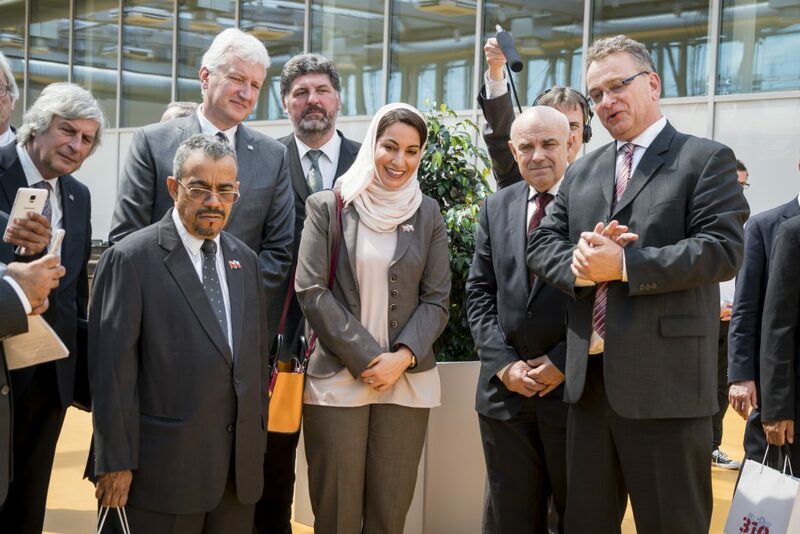 Visit of Sultan Qaboos University delegation led by Her Majesty Dr. Monou al Said, and the executive rector Professor Ali al Bemani. General assembly of SafeLog project at Zagreb. Kick-off meeting of the kassandra project. IMR group exhibit on the Future Forces international exhibition & conference. We succeeded with destination proposal for IROS2021. So see you all in Prague in five years. We welcome Giorgos Kondylakis from Technical University of Crete, Chania, Greece as an intern. We welcome Ceylan Karakuş from Sakarya University, Turkey as an intern. Libor Preucil presents work of our group for ABB s.r.o. Our proposal for Kassandra - multi-camera vehicles' undercarriage security scanner jointly prepared with VOP cz was selected for funding by Ministry of the Interior of Czech Republic. Dr. Nazmul Siddique from University of Ulster visits our laboratory and we have a fruitful discussion about future cooperation. Libor Přeučil gives a speech at the panel disscussion Linking STEM Education to Entrepreneurship - Recent Examples from the Czech Republic organized by The American Center of the U.S. Embassy in Prague. We are taking part on the LEA-DER an international exhibition and conference aimed at special security equipment. We welcome Jérémy Taquet from Sigma, Clermont-Ferrand, France as intern for his Masters' thesis. We are taking part on the European Robotic Forum. Matteo Dorotino from Politecnico di Torino starts his research stay at IMR. The Czech newspaper Hospodářské Noviny reports about our group, CIIRC and CAK project. (only in czech). Kick-off meeting of SafeLog project within H2020 EU program holds in Karlsruhe. Annual meeting of CAFR holds in Prague. Short stay of researches from Technische Universität Berlin withing a joint Czech-German project "Highly flexible manipulation system for varying industrial environments". Gaël Ecorchard visits Technische Universität Berlin withing a joint Czech-German project "Highly flexible manipulation system for varying industrial environments". 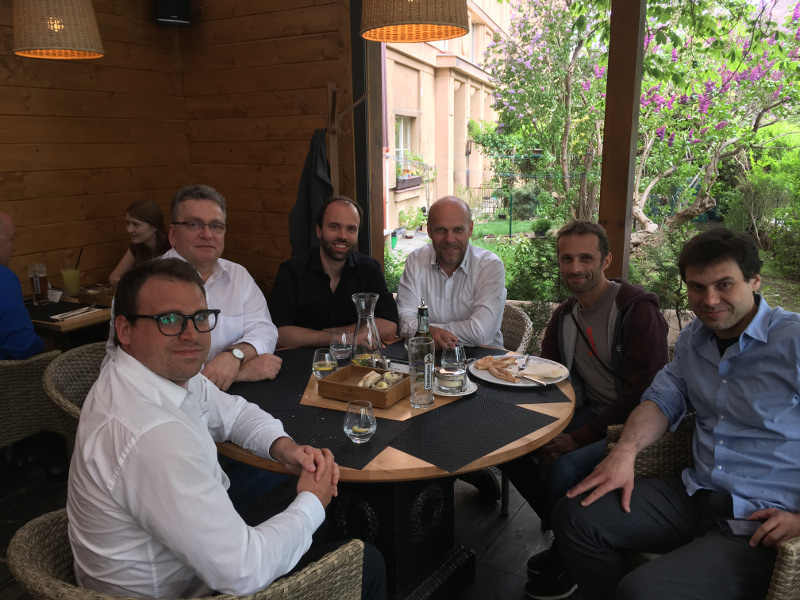 Short stay of researches from Karlsruhe Institute of Technology withing a joint Czech-German project "Multi-robot systems in Complex Environments". Short stay of Nguyen The Duy from Technische Universität Berlin withing a joint Czech-German project "Highly flexible manipulation system for varying industrial environments". Short research stay of Pablo de Cristoforis from Computer Department at the University of Buenos Aires within a joint Czech-Argentinean project "Multi-robot autonomous systems". Prof. Kazuya Yoshida, director of the Center of Robotics for Extreme and Uncertain Environments at Tohoku University in Japan visits our laboratory and give a talk "Robotics and Space Technology at Tohoku University". Study stay of Mathieu Viry in our laboratory. Short stay of Juan Jose Miranda Bront, researcher from Computer Department at the University of Buenos Aires within a joint Czech-Argentinean project "Multi-robot autonomous systems"
IMR group presents on the International Defence and Security Technologies Fair in Brno. IMR group becomes a part of Czech Institute of Informatics, Robotics and Cybernetics, Czech Technical University in Prague. We moved to new internet as well as physical address. Mirek Kulich and Martin Saska visited the Research Centre in Informatics for Engineering at the National Technological University in Córdoba and Computer Department at the University of Buenos Aires within a joint Czech-Argentinean project "Multi-robot autonomous systems". Short stay of researchers from Karlsruhe Institute of Technology within a joint Czech-German project "Multi-robot systems in complex environments". IMR group will exhibit on the Future Forces NATO exhibition & conference. 3 presentations of IMR members will be given at ICRA 2014. IMR seminar - Tomas Baca - Control of multi-MAV swarms, 11:00, E132. Presentation of IMR group at MESAS'14 organized by the NATO Modelling and Simulation Centre of Excellence. 4 presentations and a live demo. IMR paper Coordination and navigation of heterogeneous MAV-UGV formations localized by a hawk-eye like approach under a model predictive control scheme accepted for publication in International Journal of Robotics Research; IF:2.863; Ranking:1/21 in Robotics. Best paper award of ICUAS 2013 for IMR paper was announced at conference website. Final review meeting of European projects Symbrion/Replicator was held in Stuttgart. The Center for Advanced Field Robotics (CAFR) is established. The IMR group is one of the founding members. Presentation of IMR group at CL13 Industry Days within NATO exercises in Lest, Slovakia. Stay of IMR researchers at University of Pennsylvania within project COLOS (joint research with Prof. Kumar's group). Open Doors Day in our group for bachelor and undergraduate students. Room KN:E-301. If you are interested in the mobile robotics and related areas, you are welcome to visit us. We introduce currently solved tasks and related topics we offer for your theses and projects. Open Doors Day in our group for bachelor and undergraduate students. Room KN:E-112. If you are interested in the mobile robotics and related areas, you are welcome to visit us. We introduce currently solved tasks and related topics we offer for your theses and projects. Lecture Haptic Rendered Practice Carillon given by Prof. Fazel Naghdy from University of Wollongong, Australia. The lecture takes place in the room KN:G-205. 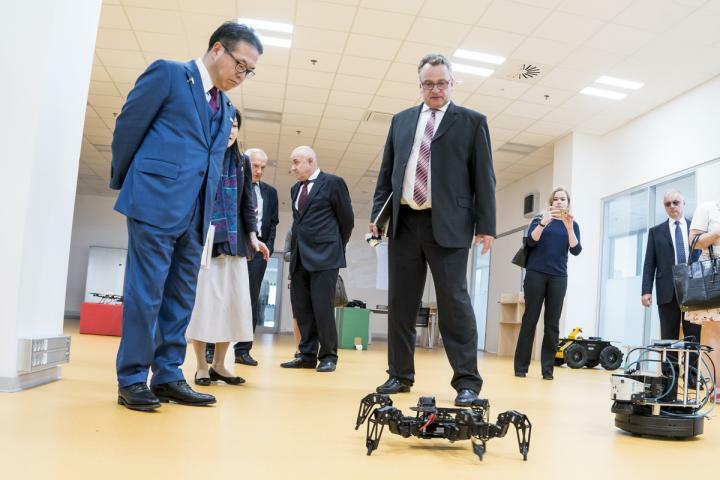 'Robotic club' meeting in Liberec. Presentation about motion planning will be given by Petr Vanek. Symbrion/Replicator General Assembly meeting. The meeting takes place in the room KN:E-301.